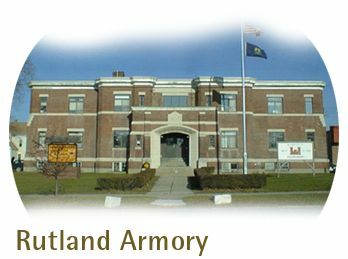 The Armory in Rutland is situated near the center of the city with commercial property adjacent on two sides. The building is divided into two segments; the front unit, and the rear unit, which houses offices, restrooms and the kitchen, is a historical landmark and veterans memorial. The exterior structure is standard red brick with limestone detailing and block back-up. Interior walls vary from concrete block to wood stud/drywall. The flooring varies from resilient tile in the office areas to concrete in the basement. The rear unit houses the drill hall, firing range and storage rooms. The flooring in the drill hall is wood. The building is fully sprinkled and has visual and audible fire alarms.